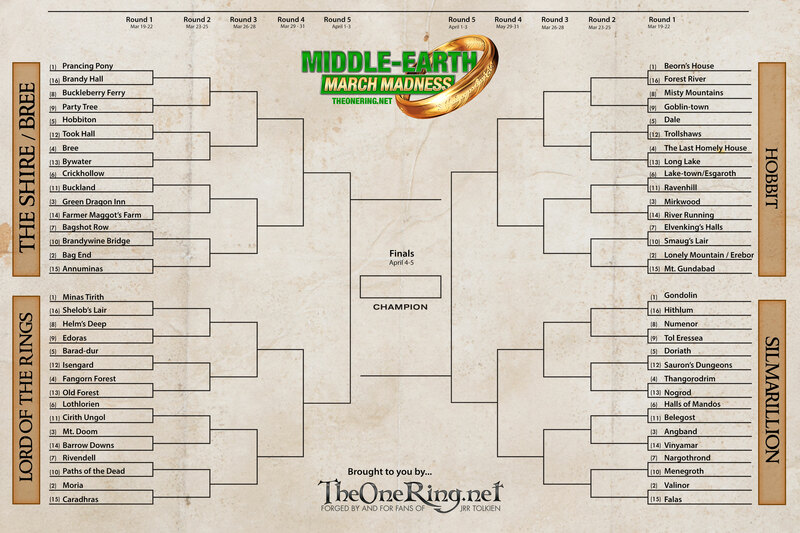 The One Ring Forums: Tolkien Topics: Main: Middle-earth Map March Madness starts now!! Middle-earth Map March Madness 2019 begins today! As promised, the four brackets for this year are all locations from Tolkien's realm, divided into sites which appear in The Silmarillion, The Hobbit, The Lord of the Rings, and a fourth bracket just for the many wonderful spots in The Shire and Bree. All you have to do to take part is vote for your favourite in each of the pairings! We start with 64 competitors; by next round we'll be down to 32, then 16, and so on until we have a final showdown between the two locations which make it to the grand final. How you choose which way to vote for each duel is up to you; logic, chance or emotion can be your guide! All that matters is that you cast your votes!